Raccoon Steals the Galaxy! News at Eleven. 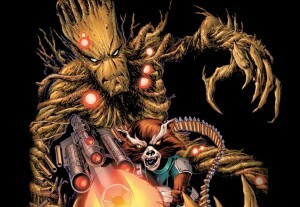 As we get closer to the summertime release of Marvel Comics’ Guardians of the Galaxy movie, we’re likely to see more and more of Rocket Raccoon — and his buddy Groot, the anthropomorphic tree. Next up: Marvel’s “first in-house original prose novel”, Rocket Raccoon and Groot Steal the Galaxy by Dan Abnett — one of the original creators of Guardians of the Galaxy in 2008. “Rocket Raccoon and the faithful Groot are the baddest heroes in the cosmos, and they’re on the run across the Marvel Universe! During a spaceport brawl, the infamous pair rescues an android Recorder from a pack of alien Badoons, Everyone in the galaxy, however, including the ruthless Kree Empire and the stalwart Nova Corps, seems to want that Recorder, who’s about as sane as a sandwich with no mustard.” Check out the interview with Mr. Abnett at Comic Book Resources, and check out Steal the Galaxy when it arrives in hardcover this July.